After my success with my last “Shabby Chic”, fully convertible pinafore, this next one is in the real deal vintage 40’s style as a one piece dress. This pinafore dress has an amazing attention to detail and the way it was designed includes a new-to-me shoulder seam method. 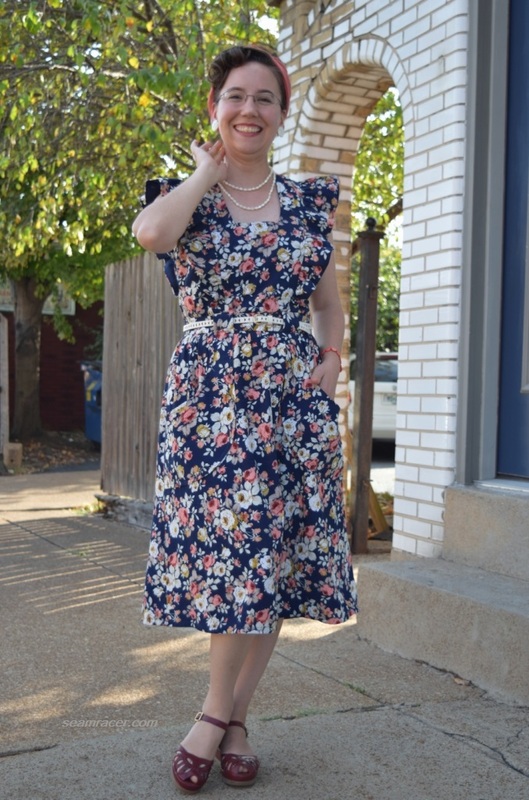 This is also my first time making an Anne Adams brand pattern…and I love the fit, style lines and proportions. It might not receive as much out-and-about wear as my last pinafore, but I think this was the most perfect use for a longtime orphan (material not yet matched to a pattern) in my fabric collection, a quaint feedsack printed seersucker I’d been holding onto for years. Yay – one more bolt of fabric is out from my stash and able to be enjoyed. 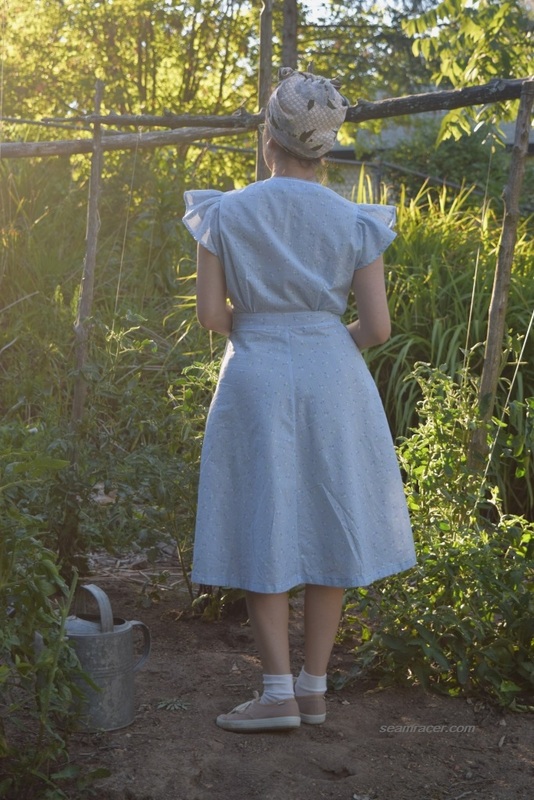 If you’re confused about what a pinafore is, please see my preceding introductory blog post on “The Summer of the Pinafore”, the inspiration behind my recent sewing. 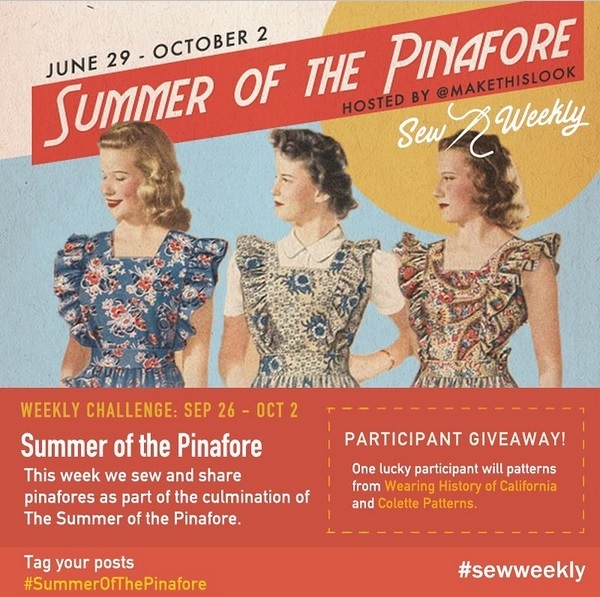 This post’s pinafore is not like the multi-use floral one with a modern flair that I blogged about last, so here I will further explore the colors, fabrics, and prints used in the history of pinafores. It’s weird to see how pinafores seem to reflect deeply subtle societal changes in the times around them. A garment for the basic needs of women and children has a surprisingly very rich history. NOTIONS: I used everything from on hand in my existing stash – thread, bias tape, interfacing scraps, a card of vintage baby rick-rack, a vintage metal zipper, and three vintage buttons from hubby’s Grandmother. TIME TO COMPLETE: Making this pinafore took me about 15 to 20 hours and it was finished on July 22, 2017. TOTAL COST: This unusual vintage specialty fabric was bought at Wal-Mart…of all places…as a “value print calico”. I still had the receipt with the fabric. 2 ½ yards was bought back in March 2013 for $6.88. What a stinkin’ great deal! This is one of the very few patterns in my stash that had a very deep set personal, self-imposed “duty” to sew myself a version. Why? On a practical level, the pattern and its instruction sheet are absolutely crumbling to dust so I felt an urgency to make a dress from this design before the condition of the paper turned dire. There is a better reason, though. There is room to believe the original owner/recipient might be a distant relative we never heard of before! You see, one weekend, on my occasional visit to our city’s antique and vintage shops, I came across a shocking and exciting find of a 1940’s pattern, whose old postal recipient had the exact same last name as ours. Her address was in our same city, quite nearby, too. Our last name is on the more unusual side, and it’s in the traditional German spelling, so the family has always said that anyone else with this same name in town was probably some relative, however distant. Finding this pattern make the family dig into our genealogy again. To make things even more special, the year of 1943 was written on the instruction sheet…very much appreciated because mail order patterns are seldom able to be so specifically dated. Everything about this pattern was a touching, exciting, special opportunity…probably something that will not happen again and a neat happenstance to find in the first place. Whether rightly or wrongly, I somehow was surprised at the amount of detail and well thought out design to this pattern, as if I thought mail order patterns were second rate. I feel bad now because this was a killer pattern not in a standout or “chic” fashion way, but by having a great fit of both pattern pieces and finished dress, nice instruction sheet, and impressive design lines. I am probably so used to primarily using patterns from the four major brands in every era (Simplicity, McCall, Butterick, Vogue), as well as the coveted yet well-known defunct brands (DuBarry, Hollywood, and Pictorial Review, to name a few). I realized from using this Anne Adams pattern that I should give more mail order patterns a better appreciation. Anne Adams from my knowledge is an all-American pattern company (yay!) which lasted from the 1930s to the 1960s and were the last to use unprinted, pre-cut tissue. Her company’s patterns were available through the local newspapers along with related Marian Martin brand. 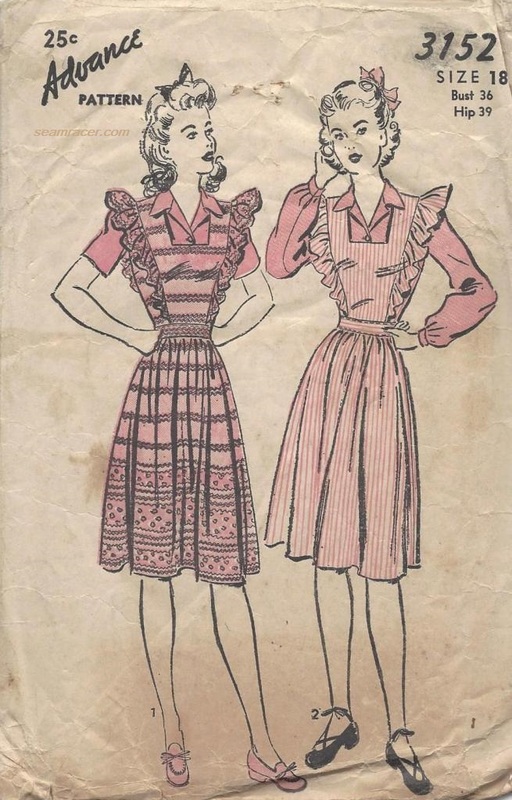 Apparently, Anne Adams designs were from uncredited designers who tailored to real women, offering larger sizes and even customizing designs for local fashions trends (so the city girl and country girl could have their own style)! Many Anne Adams patterns do have scalloping as part of their designs, with a penchant for trimming, so I suppose this pinafore is a semi-classic design for this company! 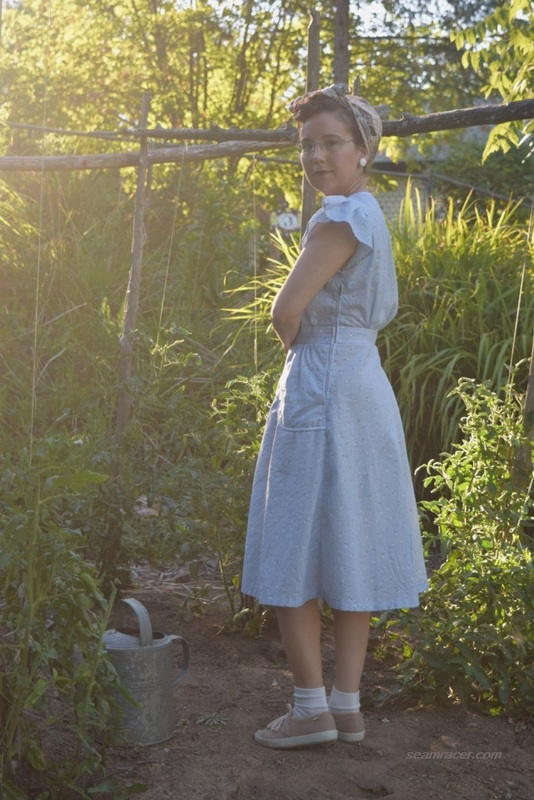 My pinafore does strike me as a very country girl look for a city woman to purchase…I can tell the pattern pieces had been used before so I’m really curious if it was the original owner – our mystery distant relative – that made this for herself! This was unexpectedly challenging and sort of difficult in the way of being quite detailed and having many steps to make. This step had to be done before this step…oh and don’t forget the trim…was the sum of my sewing progress in repetition. I really needed those crumbly, falling apart instructions and the fact that there were substantial parts missing made sewing a bit more challenging. Not meaning to brag, but for many garments I’ve been making recently, I have not needed the instruction sheets so having a project be a surprise challenge was a good change. There is really a lot going on with this dress! Most of it is in the front, and although the back is rather basic, it does have first-rate seaming and shaping. I enjoy how the vintage metal zipper I used in the side really makes my pinafore strike me as close to an authentic vintage piece. Asymmetric scalloped bodice closing, tapered rectangular neckline, set-in waistband, center front skirt box pleat, and curved, set-in-style pockets are all awesome, but I like the sleeve ruffles the best. The shoulder seam is defined by the spot where the gathers are brought in and stitched down. The smart part is that they are set into the main body of the dress! 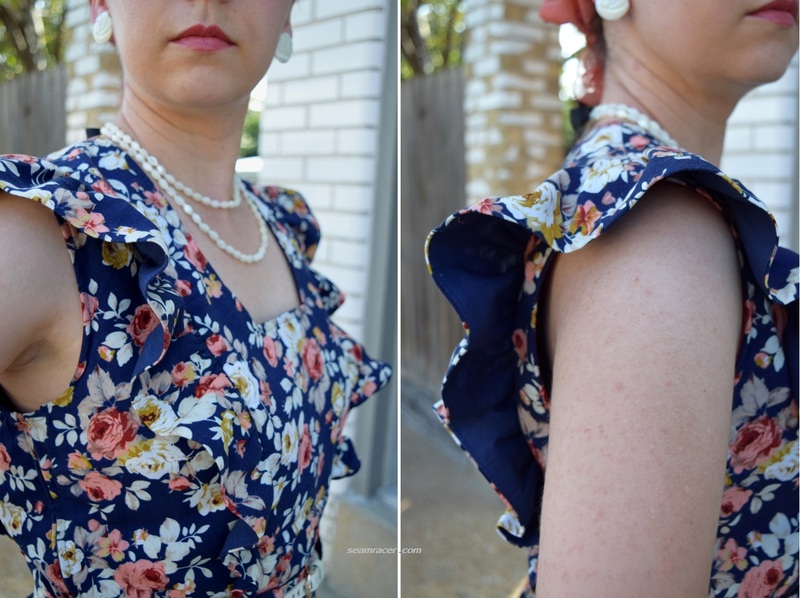 The horizontal shoulder seams, which run from the neck outward, are divided into two separate seams – the true shoulder and the over-the-shoulder ruffles – by the vertical opening for the gathering to work. This did make the bodice one big piece tow work with! I had to iron the finished ruffles and stitch the seam allowance flat (facing towards the neckline) so that the over-the-shoulder ruffles don’t flare upward obnoxiously…what they want to do! They might be over the top but these ruffles are so fun to wear and were interesting to sew – not to forget mentioning extremely comfy, too. The openness of the sleeves and the airy breeziness of the ruffles make this so very easy to move around in, stay cool, and have all the freedom to perform all the necessary or menial tasks a pinafore is meant to be worn doing. I’m not one for rick-rack on my clothes, by I’m actually surprisingly won over to the benefit a card of the vintage baby size notion added along the edges here! As I said before, the quainter a pinafore is made, the more it is jazzed up with novelty embellishment, it only makes it look all the better. Without the rick-rack, anyway, I do believe much of the seaming details would be sadly lost. I just made it – I only had about 4 inches leftover of the rick-rack after I was done adding it along the pockets and neckline edges. Whew! I couldn’t cut it any closer if I had pre-measured how much I would’ve needed. I really think this project was meant to be! The slight puckering to this seersucker makes it simply a dream to wear and work in. Reproduction aside, this is (to my knowledge) the true vintage way of doing seersucker – not the giant bubbled, ugly print stuff I see offered nowadays. It is so cooling the way it keeps an airy distance from off of the skin. It holds a good shape without being too stiff or getting droopy yet stays soft and comfortable due to the brushed all-cotton content. Fabric like this is a goldmine to come across these days and that’s a shame. I’m glad I resisted the urge to hoard this because now I understand why its material gold…it’s not just because it’s rare, it also great to wear! 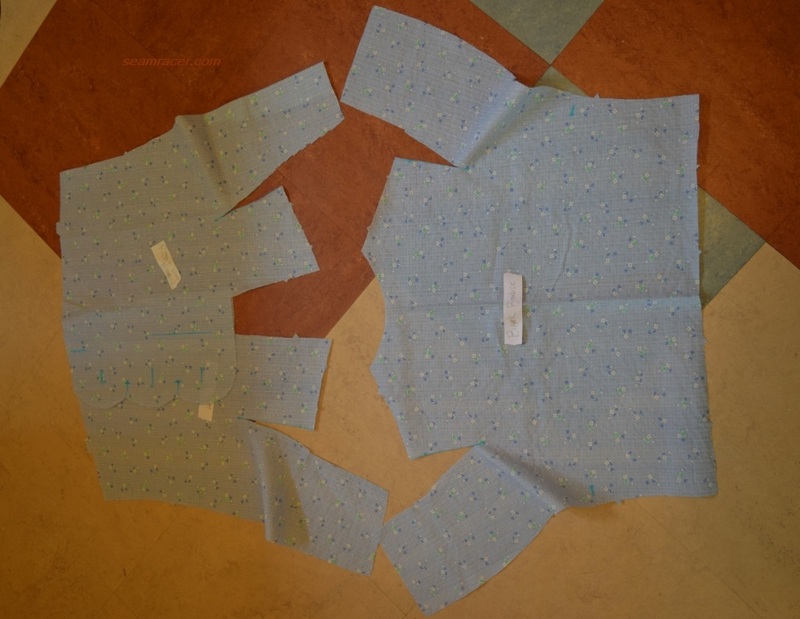 I suppose I went with a rather traditional color tone for pinafores by making mine in a primarily baby blue print. You must remember, that in the 1940s blue was still considered a woman’s color and shades of red, including pink were a man’s tone. The modern opposite methodology of thinking was not around as of yet (read a further explanation of the gender significance of pink and blue in this past post of mine). Even Hollywood used primarily blue pinafores to costume their best actresses in the decade of the 1940’s, the era I see the most pinafores on the Silver Screens. 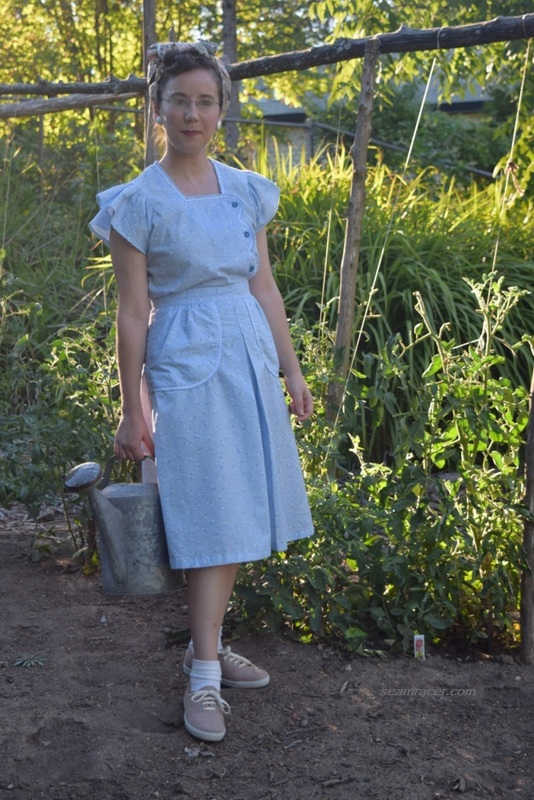 Perhaps the most famous of the blue pinafores has to be the gingham bib-style one worn by Dorothy in the 1939 movie “The Wizard of Oz” (of which I made my own version for a past Halloween). Also, the popular 1945 musical movie “State Fair” abounds in blue toned peasant looks, aprons, and pinafores. 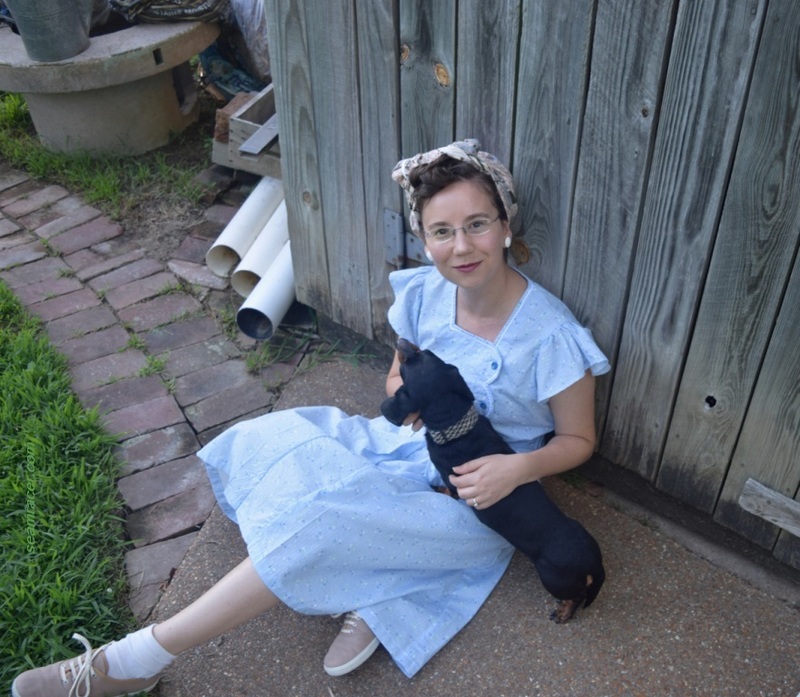 The movie’s main actress Jeanne Crain wore at least two shoulder ruffled, baby blue pinafores that were really more like jumpers than my own dress version. For another obnoxious shoulder ruffled Hollywood pinny in a more basic color of white, I’d like to highlight one that Betty Grable and her associates wore in the 1944 movie “Pin up Girl”. There’s even rick rack along the edges just like my own and Ms. Grable still looks hot! Traditionally the pinafore was worn for many years in primarily white and it wasn’t until the 20th century that they became something worn by anyone other than children in prints and colors. Going upon the concepts of Rousseau that children are their own entities with their “duty” being to learn, play, and be healthy, late nineteenth century girls, young women and sometimes small boys were dressed in pinafores made of plain, mostly white fabric, so they could have comfortable option to protect their clothing when they did their “work”. With this concept, pinafore from that time were a sort of “uniform” for doing what children did best. Besides, at that time modern methods of washing were not available and a basic white pinafore would’ve been relatively easy to wash, bleach and starch back to normal if dirtied. In the 20th century, this had changed to the pinny becoming part of the clothes it was originally meant to protect. 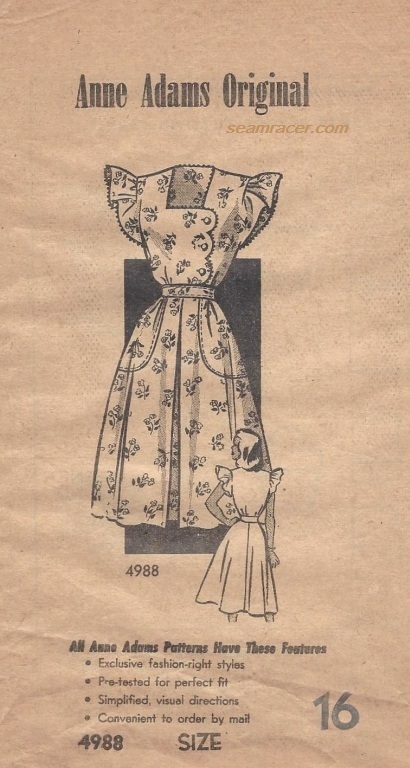 In 1946, Life magazine noted this shift in an article on children’s dress, noting that “children used to wear washable pinafores over un-washable dresses. 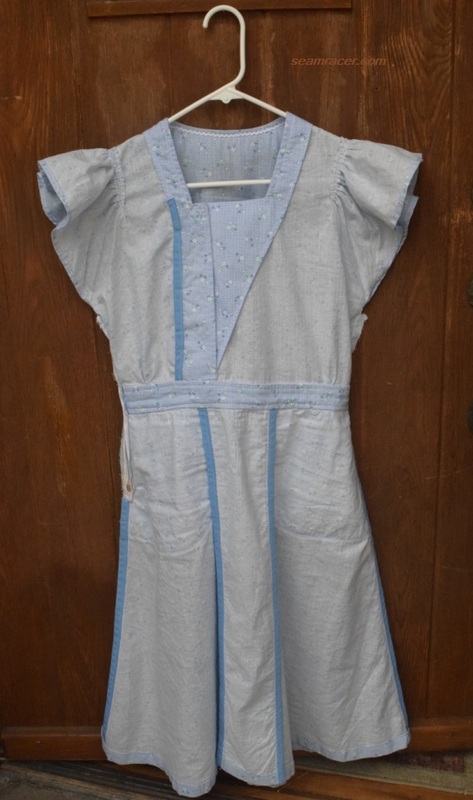 Now a pinafore becomes a washable dress.” (Quote from the FDIM Museum blog here.) Beginning somewhere after WWI (circa 1920s) novelty and juvenile prints, fabric with patented movie themes, and feedsack cottons also helped contribute to the pinafore usage switching from a basic, white, covering children’s clothes to a one-piece, fashionable garment for the dirty work needed to be done by all ages. In 1941, the U.S. had about 31 textile mills manufacturing the fabric for bag goods which, in 1942, it has been estimated that three million American women and children of all income levels (roughly 3% of the population) were wearing at least one printed feedbag garment. The element of fun was definitely brought in to loosen up the “uniform” of a pinafore with printed, colorful fabrics. For adults to adopt a garment as childish in historical use, so sweet in its styling as a pinafore, I don’t think it’s because of being in a wishful time-rewind fantasy world. Yes, it can be out of place to adopt the fashions of an age group different than your own. I see it as extending the practicality of a garment, and bringing some lighthearted charm to mundane tasks with something as basic as what clothing is worn to perform necessary tasks. The rise of the “junior” class of teenagers mid-1940s no doubt further propelled the idea of staying youthful (a key theme of pinafores)…what they found popular, adults paid some heed to and women found ways to bring their trends into their own style when desired. Sure, pinafores evolved somewhat into playsuits, or jumpers to be worn over blouses, and even into dresses with ruffles and trim that mimic a pinny, so there was no rigid way to achieve a pinafore look. But no matter what the kind of pinafore, they still find a way to way to mix practicality and playfulness in a way that can be perennially appealing. Clothing of today is rarely such a hybrid mix of so many different aspects of appealing yet useful, comfy yet nice in one garment. As odd as it might seem, a pinafore definitely has a place that can best be understood if you make and/ or wear one for yourself. There are so many, unlimited ways to achieve some sort of pinafore style that I’ll take a chance and say that there is one that could work for any woman or child. There are 1960’s simple A-line pinafores, 1970s prairie looks, and even modern ones out of denim or suiting. Why just a few weeks ago the famous 19 year old actress Elle Fanning was out and about wearing a fuchsia pink pinafore with a crop tank underneath and designer accessories for an up-to-date option. Perhaps my “Pretty Pinafores” Pinterest board can further inspire you to find a style that suits you, or at least find an image to like and appreciate. Let me know when you find it! Sorry, but this is not a name for an unusual kind of motor vehicle, it’s just referring to an unusual, yet very useful and attractive kind of garment which I have made! I now have a pinafore dress whose “top can come down”. Don’t take that the wrong way – all I mean is that this 40’s pinafore has been made so that it can come apart to be two separate wearing pieces if I so desire. After all, as much as I unabashedly wear this pinafore set out and about, I’ll admit it’s not something I’d want to wear in its entirety in every social setting. This way, I really don’t have to change completely…just change tops for a new and updated look. Such a dress, made the ‘convertible’ way, completely transcends the almost 80 year time gap, making it truly something that is ultimately useful and sensible…the goal of a pinafore anyway. I believe I have nailed a way to bring the pinafore to the modern wearer. I managed this outfit all on 2 measly yards, too. Guess what makes this even more up-to-date? 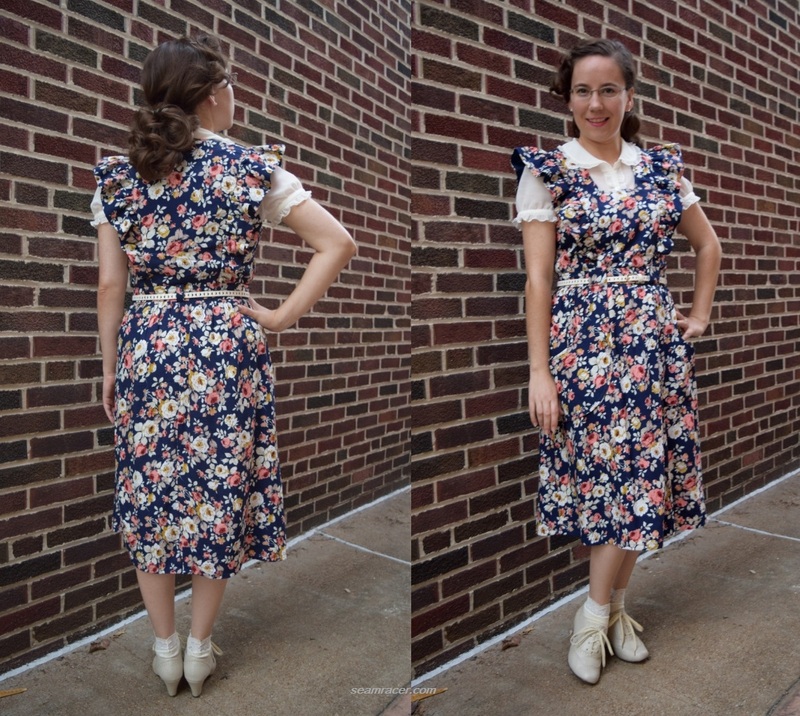 There is a hidden division to this pinafore where the top and the skirt attach at the waistline – above it is authentic to year 1941, below it is a modern Burda Style pattern. Together, they both complement one another to the point that they even the other out, like a good marriage. I see the modern bottom making the vintage top more like a trendy “Shabby Chic”, and the ’41 pinafore top bringing out subtle past references from the current design. Separate, each of the two pieces work well with others (in my wardrobe I mean) making sure one or the other sees the light of day more frequently than not. As much as I make what I like, I do always try to make garments that are still practical on some level to keep things from just hanging in my closet. After all, there’s no use in making something to wear if you won’t wear it, right? And remember – having the gift of sewing open up the opportunity for limitless ideas and customization. 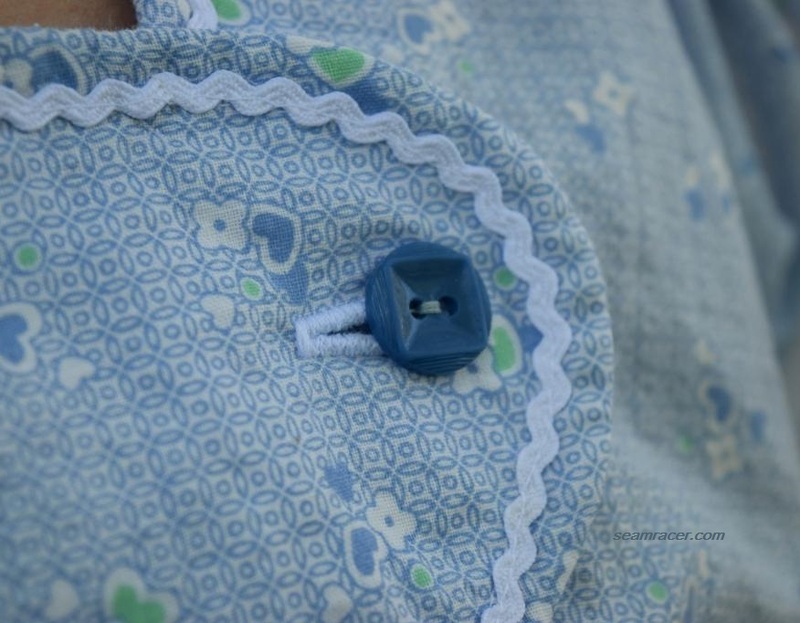 If you haven’t seen my previous post, or if you haven’t encountered this weird ‘thing’ I’m calling a “pinny” (which is short for pinafore), I’d recommend you head on over a read it, please, for an explanation. Face it, a pinafore is smarter than modern clothes anyway, because at least it has giant pockets that really do fit a smartphone (little would a woman of the 1940’’s have guessed such a use)! It’s every bit just as comfy, probably more so in my estimation, and a lot more fun! Finally, the way I made it, all I can say is thank you to the person who invented snaps and hook-and-eyes, however, because otherwise this two-piece dress would not have been possible! In most pictures, I am pairing the pinafore with a vintage rayon scarf to keep my hair in place, and a vintage necklace of mother-of-pearl oblong beads with matching mother-of-pearl carved earrings from my Grandmother. My newest favorite shoes, lovely Re-Mix “Dara” 40’s style wedge sandals in burgundy red, are a comfy and colorful option for casual class! I am also sharing some other photos of just a few of the endless outfits that match with my new favorite me-made – this pinafore! NOTIONS: I used a card of size 2 snaps as well as 4 of those flat, slide-closed, waistband-style hook-and-eyes around the waist. I used PLENTY of navy thread, and a little interfacing along with some mesh netting as another kind of stabilizer (more on this down later). 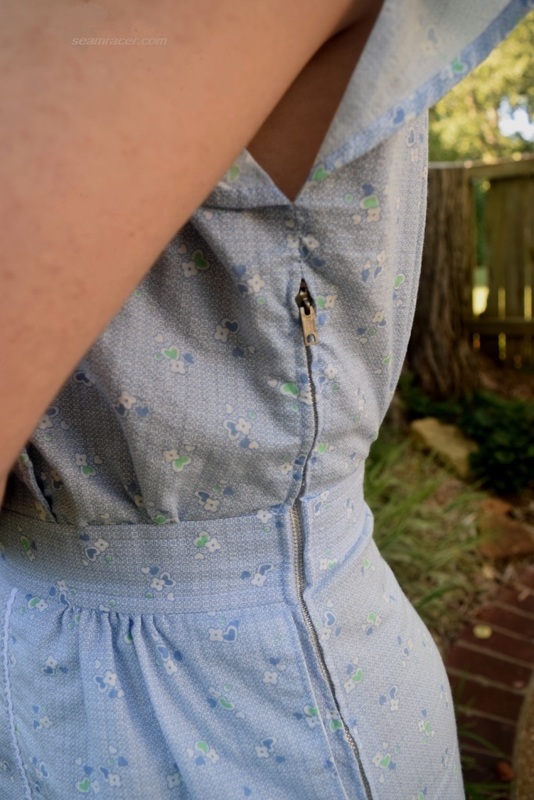 There is a vintage metal zipper for the pinny bodice, and a modern zipper for the skirt (even my zipper choices attest to the fact of which part of my dress is vintage and which is not). Everything I used was extras on hand and came from my stash. TIME TO COMPLETE: This was made in July 2017 in about 15 to 20, which is not bad at all for all the gathering and extra trouble to make this into two separate garments. This sound cliché, but to tell you the truth I wasn’t really counting time because I was enjoying myself…until it came to the snaps and hooks…ugh! THE INSIDES: So nice and clean! All seams to the whole dress are either covered by fabric facings or in bright, rich burgundy red bias tape. I do love the flash of color the bias tape gives when my tiny hem is seem as my skirt blows or I sit and bend over. Surprise! TOTAL COST: This fabric was bought from Jo Ann’s store for about $12 and the cotton was just a few dollars more. After my recent jumpsuit that I divided up into two pieces, I kind of knew the premise of how to make my pinafore a two-in-one. 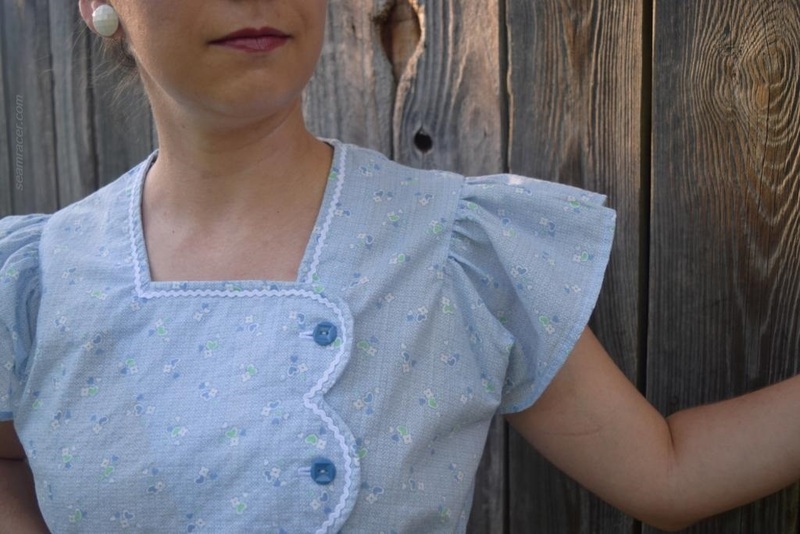 The biggest complications were the facts that both top and skirt of my pinafore needed zippers, and the droopy challis wasn’t going to cut it as stand-alone ruffles without a supple support. The skirt was whipped up first – practically a few hours in one afternoon – and then the pinny came in second. As I was making this pinafore, I was severely doubting whether this was a total waste of time. 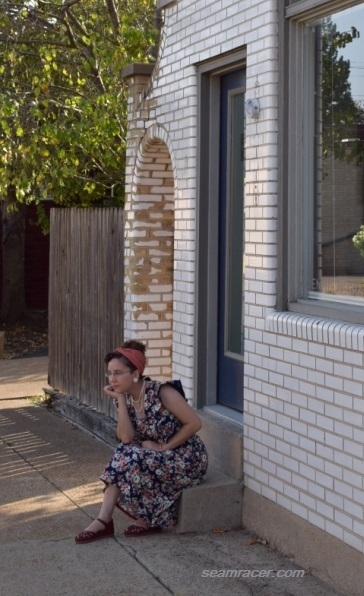 I’ve never really made a pinny before, unless you count my Dorothy from “The Wizard of Oz” apron, so how did I know that I would love it once it was done, tried on, and accessorized? The pinafore pattern I used was in a size too big for me, and, from my experience, smaller brands like Advance run on the large size. 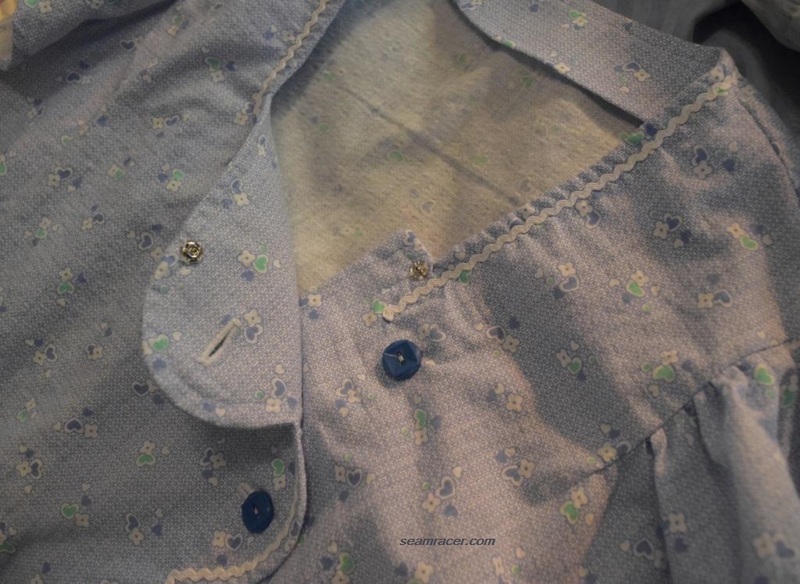 However, as this should also have the capability to be worn over a blouse and be loose and comfy anyway, I only cut off 3/8 inch (the seam allowance amount) from the side seams and it still ran roomy with my sewing in ½ inch allowances. I went a size up than my “normal” Burda Style skirt size, to match with the roomy waist of the pinafore top. 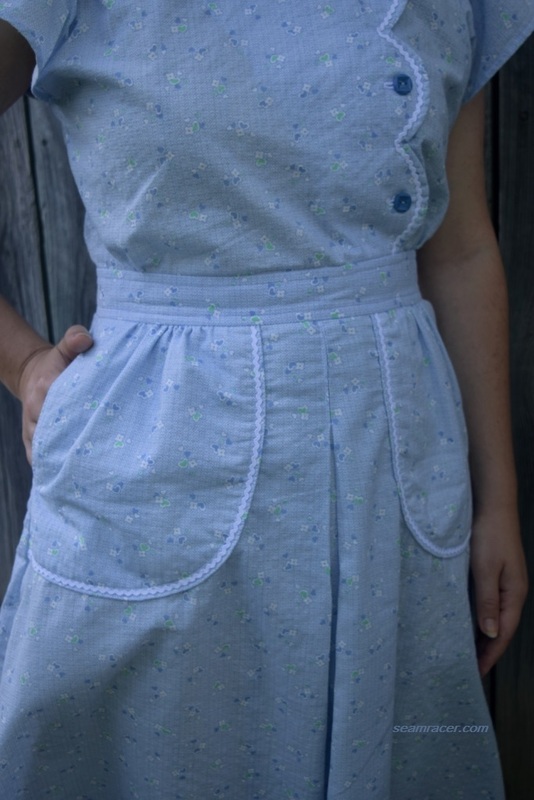 The generous waist pulls in nicely with a belt when worn alone, and doesn’t need pulling in when it’s attached as part of the whole pinny. The awesome belt loops save the middle of my divided pinafore. 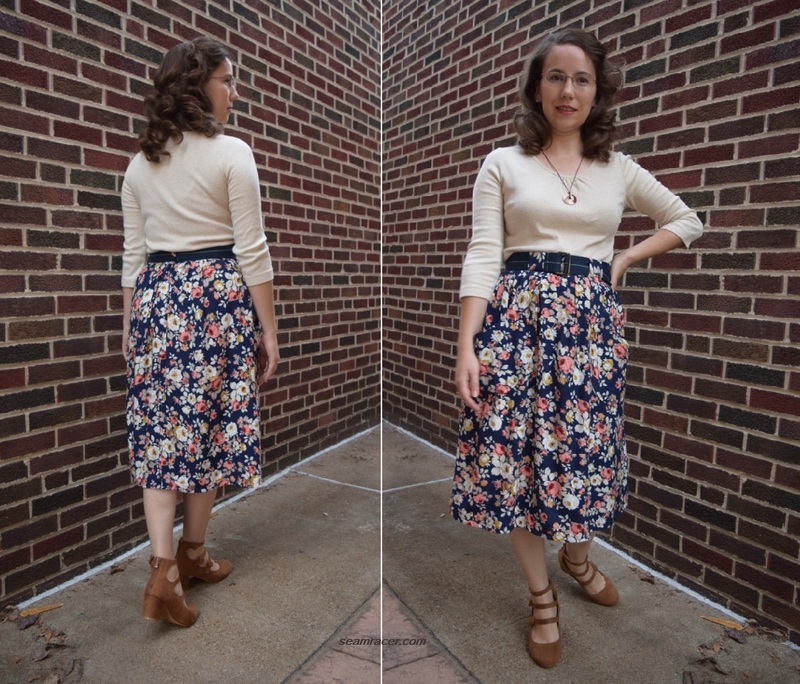 Technically I could count this as part of my ongoing “Retro Forward with Burda Style” blog series because the skirt’s lovely arched pockets have continuous cut-on belt loops for the waistband much like several 40’s patterns I have come across. Advance 4344 or Vogue 7519 have very similar pockets. 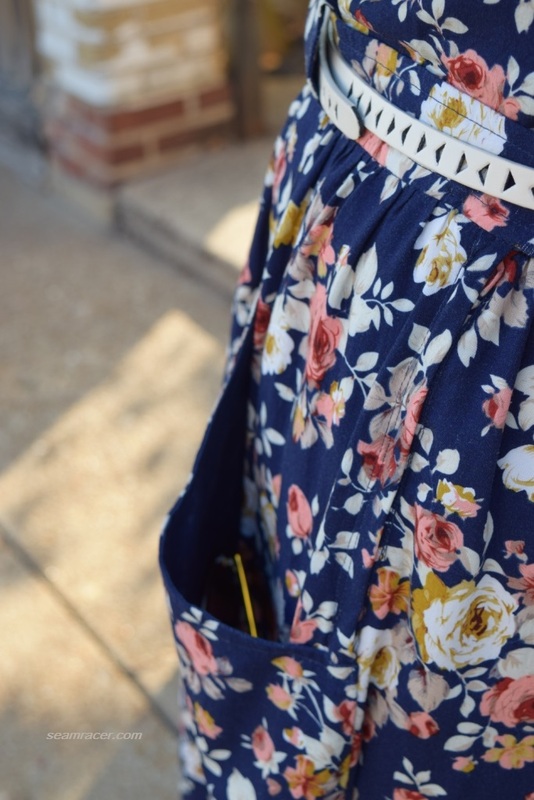 I faced the entire wrong side of the pocket in the navy lining cotton, and it’s a good thing because the pockets have a wonderful flare out to add shape to the skirt silhouette besides also making sure they don’t get lost amid the rest of the busy print. I added a center back belt tab to the waistband as well, to make sure wearing a belt actually keeps things in place. Those awesome ruffles are hiding a neat trick I tried out for a new kind of interfacing. In order to make the rayon challis keep its shape without the stiffness or fuss of applying interfacing, I used wide mesh tulle netting. I’m talking about that see through stuff that is in a million different colors, and is formed in honeycomb design. I bought some already to use as crinoline for another project, and it worked well. For the pinafore, navy tulle is in the front center and back center panels of the bodice, sandwiched in between the rayon and the navy cotton lining, giving the body a nice semi-firm bib fit which would gently keep its squared off shaping. There is a layer of tulle in each of the over the shoulder bodice ruffles, as well, in between the lining and fashion fabric similar to how I did it for the body panels. Because I under stitched the ruffles’ outer seam allowances to the lining cotton, the outer edges are thread free, clean edges. I was initially worried at how the tulle would gather along with all the layers in the ruffles, but sewing them was no harder than any other gathering I’ve done. The trick to having the ruffles lay perfectly over my shoulder, away from my head, was to direct the seam allowances the right way for this on the inside and then invisibly “stitch in the ditch”, through all layers – floral rayon, tulle, and cotton lining – at the base of the ruffles to keep everything in place. 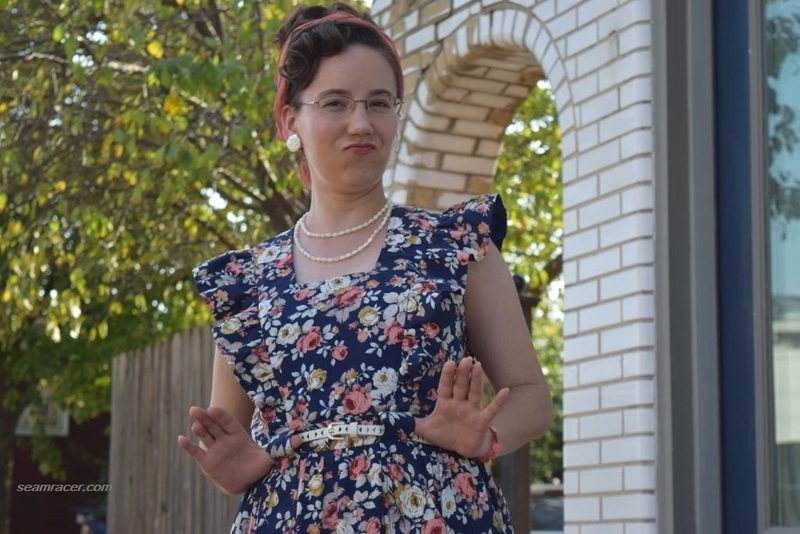 Keep in mind the pattern never said to do most all of these steps that I’m explaining – the tulle interfacing, lining the ruffles and bodice, and even stitching through the seam lines – but my pinafore top is so much better for it. Sometimes overthinking can get me into trouble, but this was a case of merely thinking a project through, I believe, from how well my ideas worked to improve some potential ‘problems’ with my fabric choice. Sometimes, I do believe sewing is truly a branch of engineering. I can find no clear explanation for the very frequent use of ruffles on pinafores, other than the fact that it probably comes from their relation to both the child’s garment as well as the folk-influenced fashion of the dirndl. 1940s pinafores, peasant styles, and dirndls all can employ ribbons, lace, rick-rack, felt appliques, or embroidery for optional decoration so ruffles on a pinny were probably added for the same reasons as the rest of the embellishments. Remember that even though a fashion dirndl is officially a skirt, the Germanic form does include a bib-suspender combination which unifies the whole thing, and the blouses to be worn under them could have the frills instead. Peasant blouses and dresses can be somewhat obnoxious, oversized, and frilly like a pinafore, too, besides the shared fact that the adolescent crowd made them popular. Even if adults wore these fashions they were supposed to bring on a ‘youthful’ connotation. The cross-over is unexpected perhaps, but worth consideration, I believe. I’m guessing, though, the use of these embellishments for a pinny could merely stem from the simple desire to jazz up a basic garment meant for work and maybe play. The system I devised to close and connect the waists of the two-individual pieces into one might look and sound like a convoluted mess – but really it’s not! 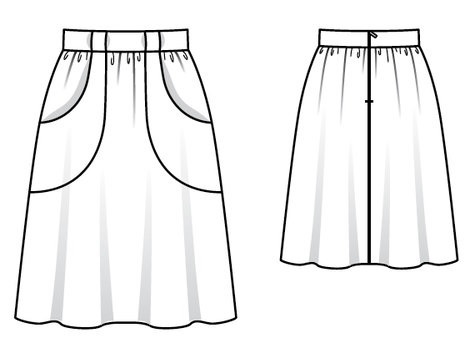 Both the top and the skirt each have their own side zippers, with a hook closing tab at the end like any garment. The bodice closes on the right while the skirt closes up the left so that the two zipper wouldn’t end up overlapping each other. 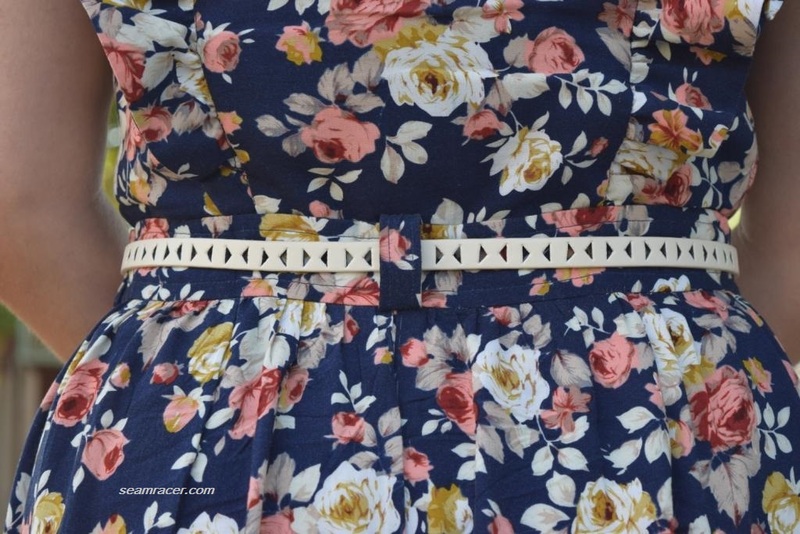 In between the two sides of my waist, is a predictable pattern of two snaps and two hooks as well for each front and back, with one extra under the center back skirt belt tab. That’s about 9 extra closures! All of this hand sewing and measuring needed for this finishing of the horizontal waist band connections was such a pain in the neck, I really was gritting my teeth not to give up on my idea completely. Finished now, I’m in no hurry to do this again but as much as I love the versatility of this divided set, my guess is that I’ll do this kind of thing again soon enough. Many bib-style pinafores were button on and off in the 1940’s, but I wanted something that would give a stronger hold like the combined effort of hooks and snaps. You might be wondering, “How does she get this thing on like that?” Quite simply, much like any dress, except that the front waists are hanging separate and the back waist is still connected as one. 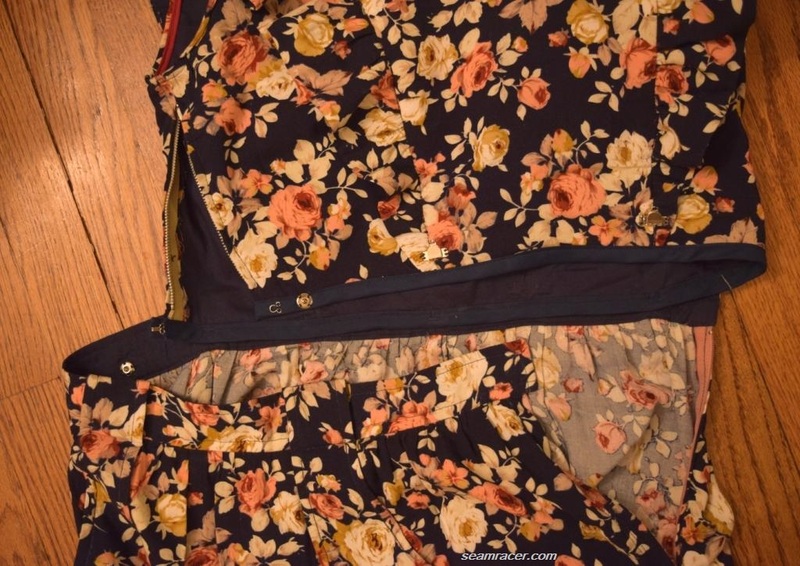 Once on me, the bodice is zipped up, the front waists are connected together around over to the other side of me where the side skirt zip is then closed. Nothing quick, but it’s not complicated or fiddly – just methodical and definitely sort of a unique experience. If you follow my Instagram account, you might have seen back on March 14, I posted a picture crushing over this dress’ fabric right after I bought it. Then, I planned on pairing it with an orange/peach coral toned polka dot cotton for a matching blouse. Yes, I still am holding to my plan – it’s just that with so much else to pair this dress and its separate pieces with, I’m in no hurry now to make the polka dot blouse. When I do sew it up, which I plan on that being no later than spring of next year, it will be made using a vintage Simplicity #4734, year 1963 “action-back” bowling blouse, to totally see how far this set can work with any decade of fashion. I have high expectations it will work…this set keeps amazing me. It literally works with just about anything and has unlimited styling capabilities. Hollywood has not shied away from using pinafores on their best actresses with amazing, complimentary success. The 1940’s seems to have the most instances so I will focus on actresses and films from this era, with half of my inspiration in this pinny post, and the other half in my next. 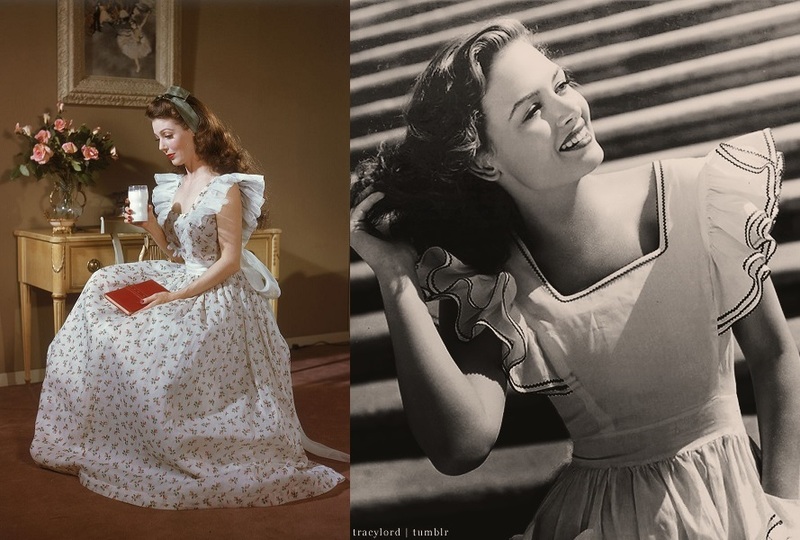 First, the cheery and beautiful Donna Reed can be seen in a 1940’s picture wearing a pinafore dress very similar in style to my own. Next, there is a lovely Loretta Young who wore a classy and dignified long length pinafore in the political version of a Cinderella-story movie, “The Farmer’s Daughter” from 1947. Finally, the best I saved for last – the 1942 movie “The Major and the Minor” with Ray Milland and Ginger Rogers. This hilarious film has the best and the most examples of pinafore wearing in any movie I’ve seen yet – I counted at least 5! 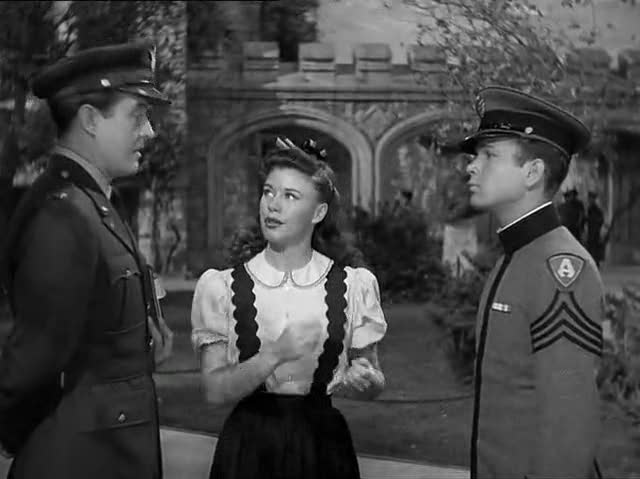 What I appreciate about the pinafores in this movie is the persona Ginger Rogers puts on with the pinafores she wears. Most of the time her pinnys are worn when she attempts to be mistaken for a 12 year old, but towards the end of the movie she dons a pinafore smock to be mistaken for her own mother! Being an awkward, no-makeup wearing pre-teen is not something anyone can think of as being the elegant Ginger Rogers, but her talent is supreme, so her pinafores ended up giving me a good idea of how a pinny is youthful, but still can be styled well enough for an adult woman to be charmingly complimentary. I see the sheer plethora of pinafore styles (each of them is different) as a tribute to her face and figure, the costume designer, and the fun, playful theme of the movie. I am amused at how a slightly different style of pinafore is used to designate her as being dignified, comfortable, and respectable older woman – different pinafores for different duties and different places in life. How interesting – I wonder if this was the case in real people’s social world, too! Either way, thank you, Hollywood for helping my inspiration! For some modern options, Simplicity Pattern Company has recently been offering pinafores, smock dresses, and apron-style garments with the Dottie Angel patterns, such as #8186, #8230, #8438, and #1080. 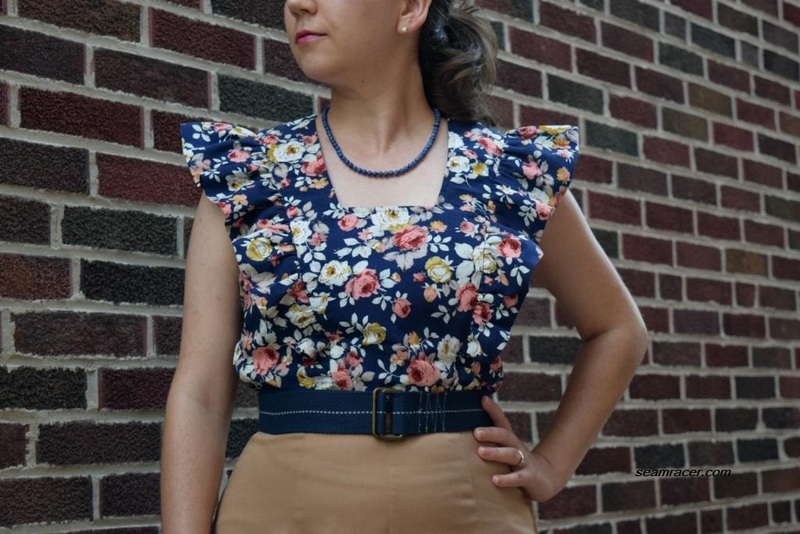 Even Burda Style has an apron-style top – Pattern #132. For more pinafore inspiration throughout the past decades, please visit my Pinterest board. Until then, my next pinafore post will be following soon!